Hi there, my darlings!! I bet you guys are really excited about today's ongoing giveaway--I hope you're all getting those entries in!! Can I just say I'm just as excited as you are?! I am so honored and touched that Angelyn of Doctor Lacquer created this gorgeous holographic thermal custom in celebration of my 1st year blogaversary! And I'm even more thrilled to be able to swatch and review it for you! On to swatches! 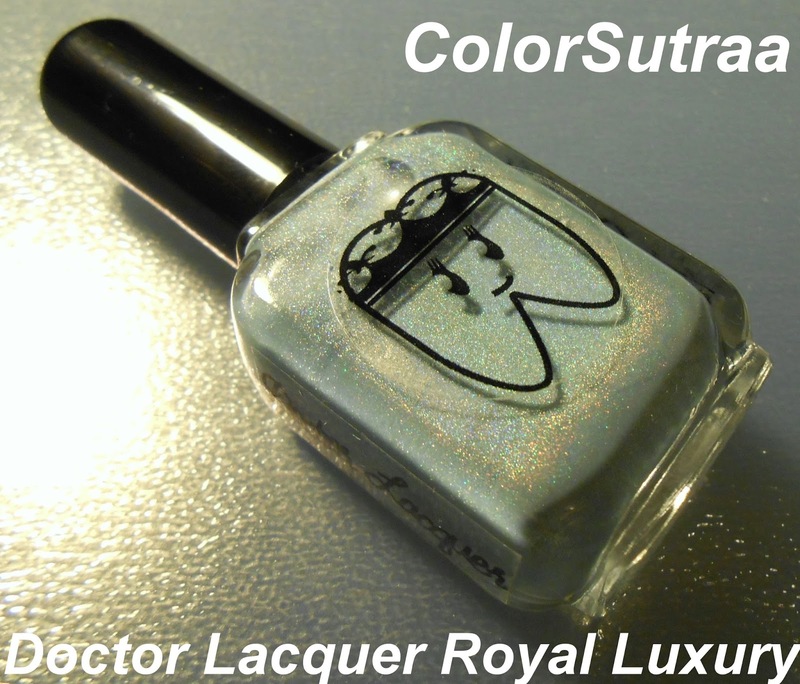 Royal Luxury is a icy blue (warm/body temperature) to lavender-purple (cold temperature) thermal color-changing polish with a strong linear holographic finish! We named it based on the meanings that colors represent--Purple for Royalty and Blue for Luxury! The application and formula of this is to DIE FOR--just buttery and smooth and PERFECT! I'd also like to mention how fast the drying time was--five minutes and it was completely safe to touch! The swatches below show 3 easy coats by itself. I'm beyond in love with this polish! And the color change isn't subtle or shy!! This polish is pretty sensitive to changes in temperature! So there you have it, my darlings! My beautiful custom from Doctor Lacquer! This beauty will be available very soon HERE for the FAB price of $11.99 for a full-size, 16.5 mL bottle! You can also follow her on INSTAGRAM for the latest updates OR let's show her some love on her FACEBOOK PAGE--either way, tell her ColorSutraa sends her love! What do you think of my custom? Will you be adding it to your stash? I always love to hear from you in the comments section below! Love! I so need to get some Doctor Lacquer polishes to send to my sister. She is graduating dental school in a few months!!! Oh man this is gorgeous! Totally perfect!